The Green is a master planned community designed and developed by Fairway Villages. 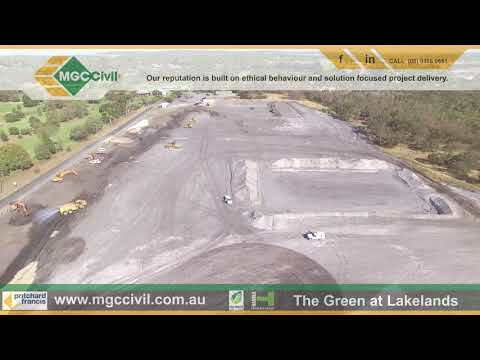 Located within the Lakelands Country Club, the community has views across the golf course and an adjacent bushland that will be retained, protected and enhanced. The environmentally sensitive setting will include pedestrian boulevards and pocket parks. The development will include 208 new strata homes and 82 apartments with two large community-use facilities, and is designed for “Over-55” lifestyle living, where residents own their own homes. Pritchard Francis has been commissioned by Handle Property Group to undertake civil engineering design, documentation, site superintendence, contract administration, and coordination of the Quality Assurance / Quantity Survey for the Wastewater Treatment Plant provider. The team has also been involved on the site since feasibility, through planning and design. Works commenced on site in October 2017.